The Society (formerly the South Australian Caledonian Society) was established in 1881 and celebrated its 125th Anniversary in August 2006. It commenced teaching Highland Dancing to Bairns (Scottish for children) in 1899 in the Triple Links Hall opposite what is now Stow Church in Victoria Square, Adelaide. In October 1925, the Bairns’ Class, as it came to be known, moved to the Society’s new Memorial Hall at 379 King William Street, Adelaide. Over the more than 100 years of its existence, thousands of the young (and not so young) learned the art of Scottish Highland Dancing until, due to modern influences, the Bairns’ Class finally closed in 2000. During its lifetime, the Bairns’ Class had many instructors including Mrs Jack Bruce, Mrs Will Lowe, Jock McPherson, Cam Miller, John Ogg, Leckie Niven, Jim Mitchell and Miss Lorna Marshall. These dedicated teachers were ably assisted by equally dedicated pianists such as Miss Luff, Mrs Shepherdson and Mrs Ogg. Pipe Major Bill Niven and Pipers Norman McKinnon and John Fleetwood also provided great support. John Ogg, arguably one of the most dedicated teachers and certainly the longest serving, coached the Bairns’ Class from 1912 and continued for nigh on fifty years until retiring at the age of 77. 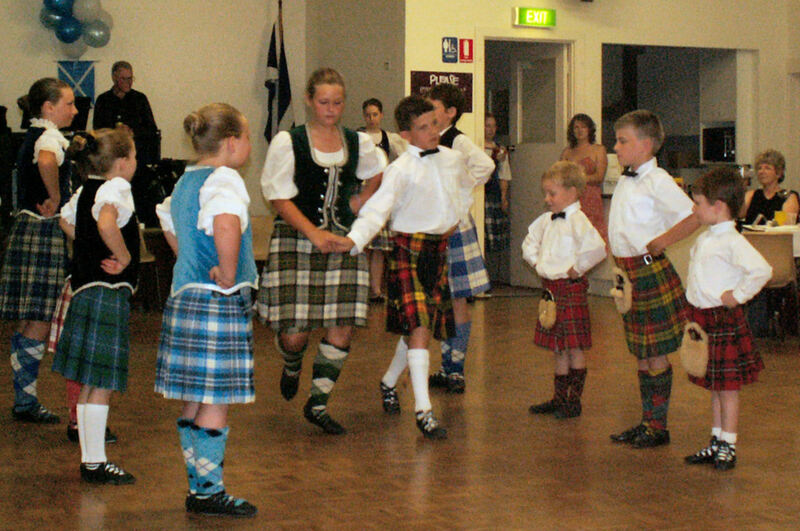 After the closure of the Bairns’ Class in 2000, there were no dancing classes until 2006 when Family Scottish Dancing Classes commenced at Tusmore Uniting Church Hall. These classes were open to both members and non members and included the teaching of Highland dances, Scottish Country Dances and also some Scottish Ballroom dances. These classes were conducted under the leadership of Leonie Garrick-Burgess, an Internationally Qualified Highland Dancing Adjudicator, Instructor and Champion Highland Dancer in her own right. Unfortunately the number of children and adults attending were low and resulted in these classes also being discontinued after 4 years at the end of 2009. Leonie Garrick-Burgess is continuing to teach the children who were still attending the Family Dance at her own Highland Dancing classes. Any member who wishes to have their children taught Highland Dancing can contact Leonie on 041 007 7067 or email her at [email protected]. Pictured above are some of the Friday Night “Family Scottish Dancers” performing at the Society’s 2008 St Andrews Day function.